John Baskerville was an avowed atheist and renown printer. Born at Sion Hill Farm, Wolverley, Worcestershire. He was employed as a footman and became a writing teacher and calligrapher. He taught himself japanning, the covering of metalware with layers of varnish usually decorated with pictures, and from 1740 made it a successful business in Moor Street, Birmingham. He lived openly with his companion Sarah Eaves, whose husband had left her, braving disapproval and gossip ignoring convention. 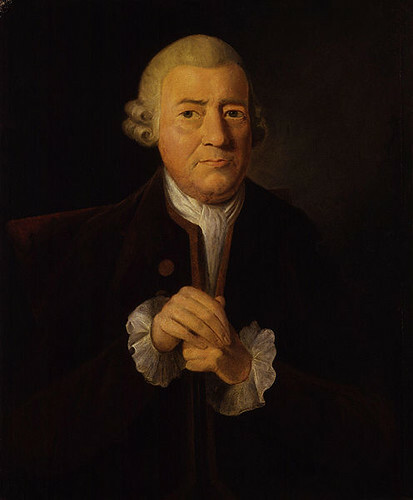 They gave support and advice to the young industrialist Matthew Boulton. Baskerville experimented in letter founding and produced several typefaces, before printing a notable edition of Virgil in 1757. He also improved printing-press design, paper-making and ink-making, and used a more spacious layout with wide margins and leading between the lines. His typefaces were greatly admired by Benjamin Franklin, also a printer, who visited him in 1758 and took the designs back to the US. That year he also became printer to Cambridge University. He produced editions of Milton, the Bible 1763 and Shakespeare 1769. An avowed atheist in his will he left instructions that he was to be buried in a lead coffin in a conical vault which he had prepared, in his own garden. After the house was sold in 1788 the vault was removed, but the coffin remained until 1821. The open coffin was put on display, for 6d a head, until in 1829 people start to fall ill! The coffin was reburied secretly among others in a church vault and only rediscovered in 1892. When the church was demolished in 1898 he was reburied in catacombs at Warstone Lane Cemetery. A Portland stone sculpture of the Baskerville typeface, by local artist David Patten, stands in front of Baskerville House in Centenary Square, Birmingham, on the site of his old home. The Humanist Heritage logo uses the Baskerville font.